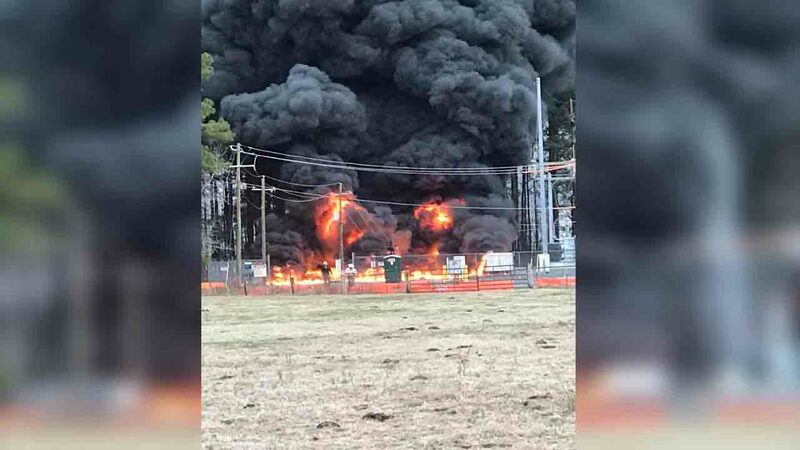 EASTOVER, NC (WTVD) -- Fire crews are battling a blaze that broke out at an electrical substation in Eastover on Thursday morning. An eyewitness told ABC11 crews they saw the fire around 8:30 a.m. on Beard Road. Duke Energy was preparing to do some work on a permanent substation on Beard Road and brought in a temporary (mobile, truck-mounted) substation and was in the process of hooking that up when the temporary station caught fire about 7:30 a.m., Duke Energy officials told ABC11. There were no Duke Energy staff members at the site when the fire started. The fire was out in about 30 minutes. According to Duke Energy's website, several power outages were reported following the incident, including several elementary schools. About 2,600 customers lost power. Duke Energy brought the permanent station back online to provide power.